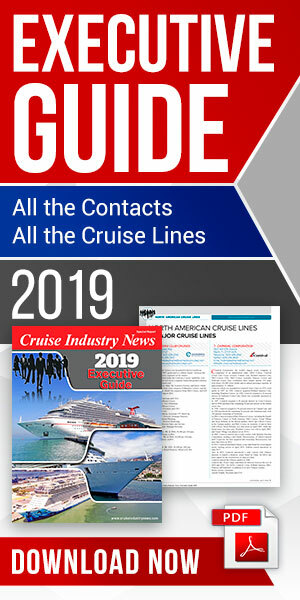 The cruise industry continued to pump out news as it gathered at an industry event in Florida. **MV Werften has signed an agreement with Wismar to purchase land which will be used for a new warehouse to house prefabricated cabin units. The new facility will cost around 4 million euro. At approximately 83 meters long and 76 meters wide, the warehouse will create space for over 300 ship cabins. The cabins will be stored on three levels of custom-designed racking. Construction on the warehouse will begin in June, with commissioning scheduled for December. **Costa will move the Diadema to the Middle East for the winter 2019-2020 season, according to a published brochure. **Expedia CruiseShipCenters, the top cruise retail travel agency franchise in North America, has announced targeted expansion plans to bring additional travel franchise locations to Texas. Joining four locations already open, and an additional seven under development, the leading travel franchise brand plans to have a total of 23 locations open and operating in Texas over the next three to five years, the company said. **Norwegian Cruise Lines is partnering with Custom Business Solutions for their fourth project, this time installing NorthStar point of sale software at two restaurants aboard the soon-to-be-launched Norwegian Bliss. Guests will be able to manage their dining experience by ordering directly from encased iPads on the table. Restaurant staff will also use iPads equipped with NorthStar for order processing. **ShipServ, an e-procurement platform, and IB, a provider of technical fleet management software, formally announced a partnership agreement, which will see ShipServ’s e-procurement solution fully integrated with IB’s InfoSHIP maritime software suite. **Fred Olsen Cruise Lines has appointed GAC UK as its agent in Newcastle and Liverpool. Under the deal, GAC will manage 18 calls during 2018 for the 804-guest cruise ship Black Watch at its homeport of Liverpool, and a further 16 for the 1,350-guest Balmoral, at its home port of Newcastle.